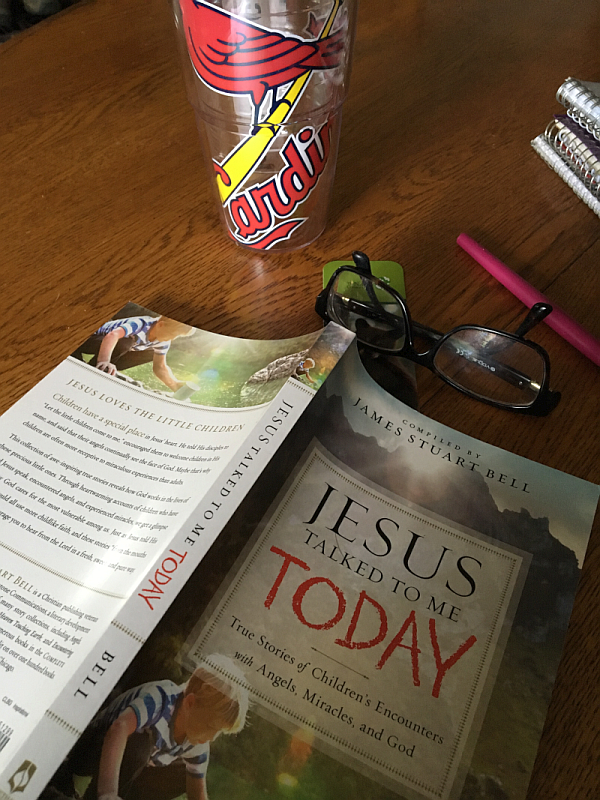 When I received my review copy of Jesus Talked to Me Today, I began reading right away. Book worms don’t believe in patiently waiting, you know. I wasn’t into the book very far at all… I think I was, maybe, two pages in… when I realized that I had just embarked on a very special journey. An extra special journey. A potentially life-changing journey. When you sit down to eat in a new restaurant, it only takes one bite before you know that you’d better settle in because you’re in the presence of greatness. The same can be said for an outstanding book. After just one bite of Jesus Talked to Me Today, I knew I was in the presence of Greatness. Capital G.
…. what do you see? Upon first glance you’d think it was a near-sighted St. Louis Cardinals’ fanatic who takes notes like it’s her religion caught mid-reading – and you’d be right, but there’s more to it than that. What it IS is a near-sighted St. Louis Cardinals’ fanatic who takes notes like it’s her religion caught mid-reading who had to take off her fogged-up glasses and put her book down, yet again, because she was so emotionally moved. I finally decided to snap a picture of what the experiences in this book kept doing to me for proof – foggy glasses and all. Mind you, I’m not complaining. When a book moves you, magic happens. It’s as though little seeds of magic are planted within the pages, and by the time you’ve reached the last page – beautiful vines have sprung up all around you. Not only did I have to pause multiple times, practically after each individual experience, to wipe my eyes (they kept getting something in them and that something was called emotion) – I also had to pause to let what I’d just read sink in. I paused after each author’s revelation to simply spend a little time with Jesus because He spoke to me through each author and it was a beautiful, beautiful thing. It’s books like Jesus Talked to Me Today that made me fall in love with reading in the first place. It’s books like this that have the power to produce more book lovers. It’s books like this that could change the world – one person’s heart at a time. Children have a special place in Jesus’ heart. He said they are the greatest in the kingdom of heaven, and their angels continually see the face of God. Perhaps that’s why children seem to be more receptive to supernatural experiences than adults. This new collection reveals how God works in the lives of these precious little ones. 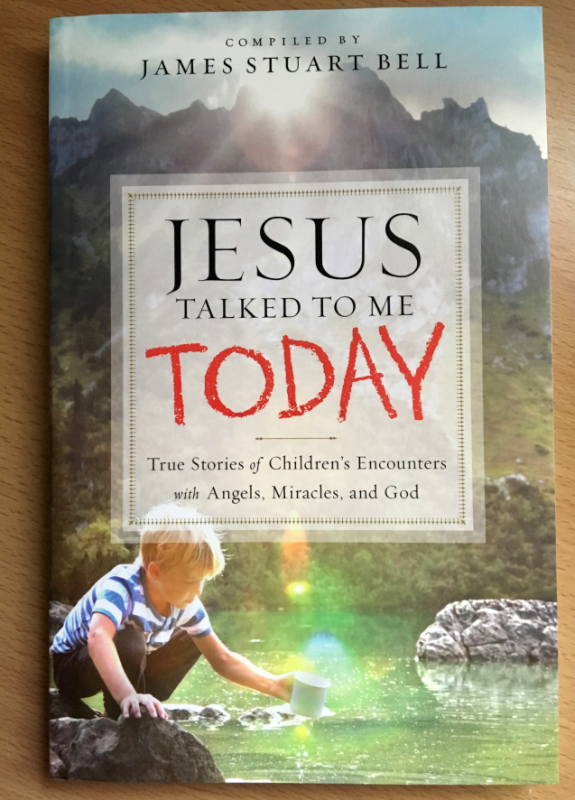 It contains the touching true stories of children who have heard Jesus speak, encountered angels, and experienced miracles. 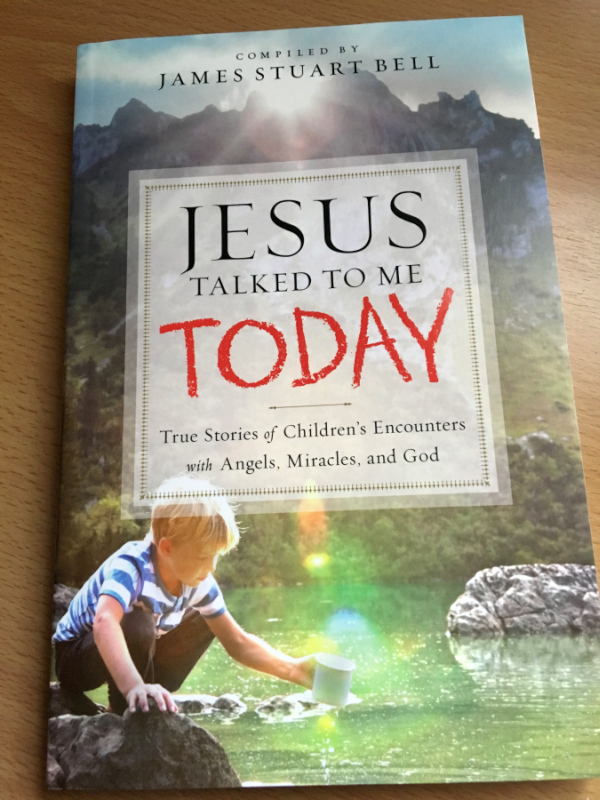 We could all use more childlike faith, and these stories &quot;from the mouths of babes&quot; will encourage readers to be open to hear from the Lord in a fresh, sweet, and pure way. The gift of exaggeration was bestowed upon me at an early age. How can I MAKE everyone read this book? How do you describe that which cannot be described? I came up with these answers.. I can’t MAKE anyone do anything. You can try, but you really can’t. Yeah, the answers really didn’t move my world, either. But this book did. It, like other special books that I have had the pleasure, JOY, and honor of reading will be passed from one of my daughters to the next, to the next. They’ve been out of our home-school for quite a few years, now, but I will still tell each that it is “required” reading. They’ll listen – and they’ll read the entire book just as their loving mother suggests – because they’re as beautiful inside as they are outside. They will also have to sit the book down multiple times and they will also find their lives changed for the better. Now, dear reader, I may not be your mother (in fact, I’m pretty certain of that). However, I care deeply about you and want only the best for you. I want your heart to be touched, as mine was, by Jesus Talked to Me Today and I want that touch to reverberate in your life – for the rest of your life. I want the seeds of magic within these pages (watered by joyful, salty tears) to grow a beautiful vine that’ll wrap lovingly around your life. Our world is pretty chaotic right now. In fact, sometimes it’s downright horrifying. Sometimes I turn the news on and turn it back off so fact I worry that my remote control will blow a fuse (or do they even have fuses?). Ugliness abounds. Short story about that – Once my husband, three precious daughters, and I moved into a small home that had, possibly, the ugliest master bedroom of all time. I kid you not, the wallpaper was dark blue with HUGE, overzealous flowers painted everywhere. The window was kind of crooked-looking, the carpet didn’t match the wallpaper (what would?! ), and even the closet was homely. We were renting, so I couldn’t rip the wallpaper down – which is what every instinct in my body demanded. Painting over it would have been a waste of time – paint hasn’t been invented that’d cover those neon flowers. All of my bedroom decor, including my bedspread, pillow cases, etc were a beautiful mauve and pale blue color. They clashed with the wallpaper in a manner that made me ill. I decided to switch all of our bed’s wardrobe to a beautiful, bright white. I bought two pillows that were dark blue, like the you-know-hideous. White lacy drapes went up. I sat a vase of flowers on a table and always tried to match the flowers on the wall to the flowers in the vase – as close as was possible, that is. It actually became one of my favorite bedrooms I’ve ever had. The addition of beauty calmed the presence of ugly. That’s something we have to be especially mindful during times like this. If the only input we have is ugliness, cruelty, lying, and terror – we will live inside of a life far uglier than that poor room. We have to add as much beauty, kindness, goodness, and love as possible. The addition of beauty calms the presence of ugly. I cannot make you read this book which… if we’re being honest.. makes my heart scream, “Doggone it!” in a thick Kentucky accent. All I can do is tell you the effect it had on me – which I’ve tried to do – and lovingly tell you that the next book you need to read is pictured below. In all its breathtaking wonder.